Range: Local in east, Gaspé Peninsula and New Brunswick south to mountains of northern New England and New York. Also mountains of Alberta, British Columbia, to Colorado and California. Aids to Identification: Arnica lanceolata has large attractive flowers resembing yellow daisies, with yellow ray flowers and yellow disk flowers on 20-50 cm tall hairy stems. Its 3-5 pairs of opposite leaves are regularly toothed, elliptic, and hairy. The basal leaves are sessile. The upper leaves are not much reduced in size from the lower. 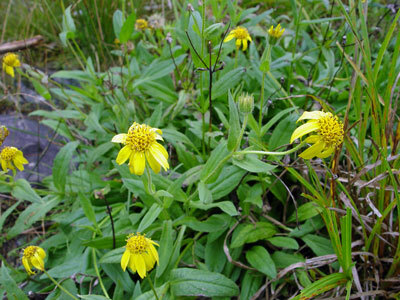 Ecological characteristics: Arnica lanceolata, unlike many other unusual plants found on the St. John River in Maine, shows no apparent preference for calcareous or acid rocks. It does seem to require moist conditions where disturbance, lack of soil, or harsh environmental conditions restrict the vigorous growth of most vegetation. Like a number of other unusual species of the St. John River in Maine and the Gaspé, A. lanceolata is a Cordilleran species apparently western in origin. Some authors view the eastern populations as a distinct species, others merely a variety of the species found in the Rockies. 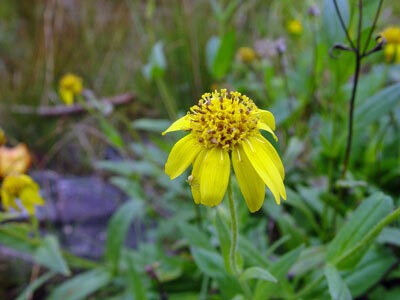 Both in the West and in most of its few eastern stations, Arnica grows in alpine or subalpine habitats. It occurs in Maine at low elevations along the St. John River, as well as on side slopes of Mt. Katahdin. Phenology: Perennial, blooms July to early September. Synonyms: Represented in Maine by ssp. lanceolata. Synonyms include Arnica mollis Hook. var. petiolaris Fern. 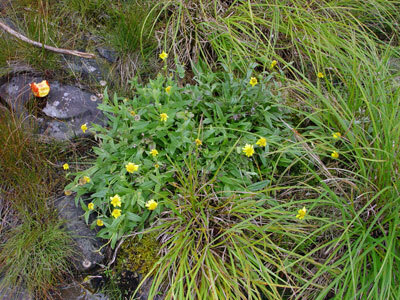 Known Distribution in Maine: This rare plant has been documented from a total of 12 town(s) in the following county(ies): Aroostook, Franklin, Piscataquis, Somerset. Reason(s) for rarity: At southern and eastern limit of range; disjunct from principal distribution; possibly scarce suitable habitat. Conservation considerations: Populations are small and grow in areas where natural disturbance can remove all or most individuals at one fell swoop.